Your garden, and other green spaces, are constantly producing seed from their existing plants. Flowering plants strive to reproduce and spread themselves by a range of different means. However, seed production is one of the most successful as the process of shedding seeds allows the plant to spread across geographical distances on and inside insects, animals, wind and water. Annual plants – those that only live for one growing season – usually produce the most as it is essential to the survival of their species. But longer lived plants also produce seed in varying quantities. Seeds form in the ovaries of plants after their flowers have been pollinated. As the flower petals wilt and shrivel the seeds and the ‘fruits’ surrounding them grow and develop. This fruit may be an edible fruit (apple) or pod (bean) or a dry seedhead (poppy) etc. But whatever the type of fruit, when it reaches maturity you need to collect the seed, which is also fully formed and ready to leave the plant. 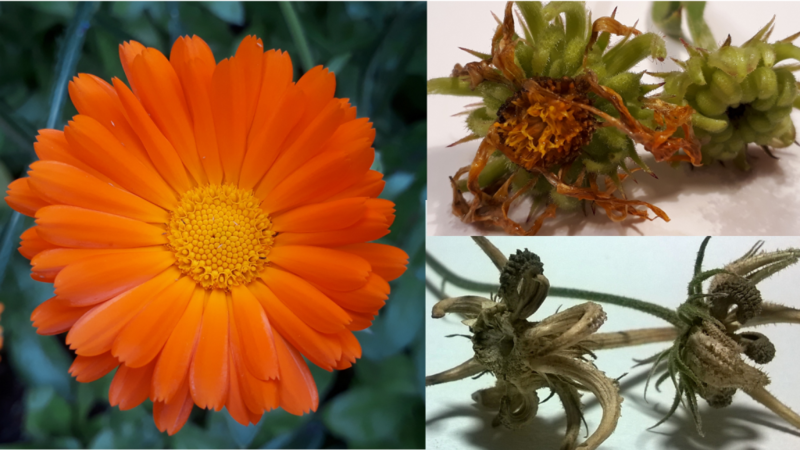 As an example the photographs above show a Calendula (French Marigold) in flower, forming still green seedheads and then then the mature, brown, dry seedheeds. This is a hardy annual plant that produces a large amount of seeds that can survive freezing weather. Its seeds can stay in the ground over winter and then germinate and flower the following summer. However, by collecting the seed and then sowing them in the autumn indoors or in a greenhouse you can ensure the plants will flower earlier than naturally self-sown plants in the ground. See my previous blog for more information about sowing seeds for annual plants. 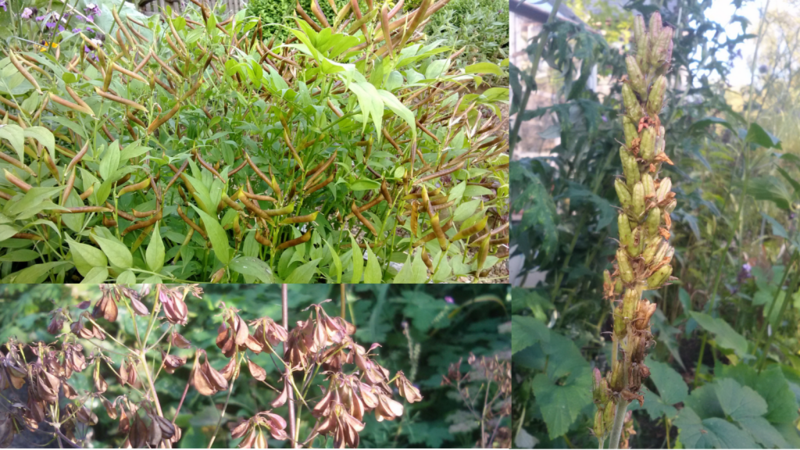 If you are collecting seed from ornamental plants in your own garden just leave a few seedheads to ripen and mature; you do not need all the seeds that the plant produces. Be patient and keep an eye on the seedheads and when they start to go brown and dry out they will be ready to collect. You should aim to collect catch them just before they start to drop their seeds naturally. Don’t harvest seeds from green seedheads as their seeds will probably be green themselves and not properly formed, so they will not germinate and grow. 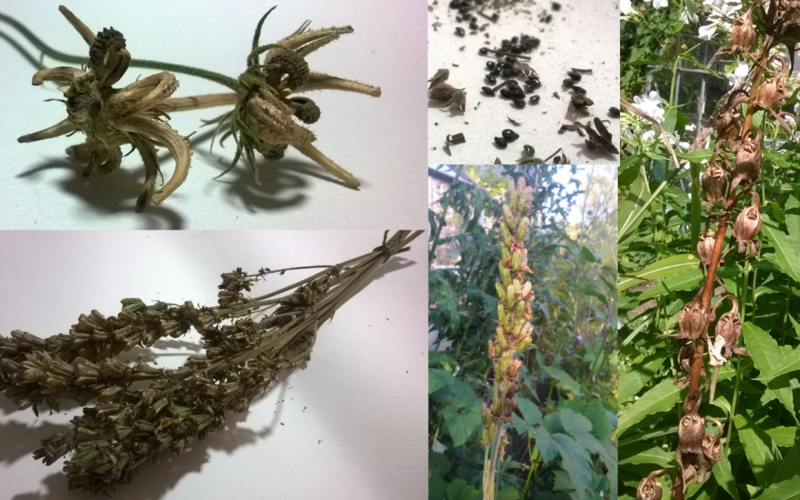 Pick a dry day to collect the seedheads and cut them with a stem attached, but remove any leaves. Tie the stalks together and hang them upside down in a cool, dry place in a large paper bag (never use plastic bags as these retain moisture and cause the seeds will rot). Leave them in place for a week and then check to see if the seeds have come out of the seed pods/heads – give them a careful shake to encourage them. If they fall out naturally remove the stalks from the bag, leaving just the seeds. The next part is fiddly so find a plenty of space at a table with good light and spread out a large sheet of white paper. Tip out your bag of seeds and sift through the plant material to remove any dried up pieces of pods, stalks and leaves to leave just the seeds. This will probably require you to carefully shake and shift the seeds to winnow out other plant material. Some seeds are easier than others, so be patient! Once you are left with just the seeds tip them into a small paper bag or envelope. Label your bags or envelopes with the plant name and date of packaging. Please don’t use plastic bags or boxes for storage as these retain moisture and cause the seeds to rot. All seeds have a strong outer case that has evolved to withstand extreme environmental conditions and only open crack to allow the new root and shoot appear when there are good conditions for plant survival. While the seed case is intact the seed is said to be dormant, but it is not dead, so when you store seed you need to provide conditions that keep the seed alive but dormant. They need to be kept dry in paper bags/envelopes or tin containers (large biscuit tins are ideal) in a dark, dry and cool place. 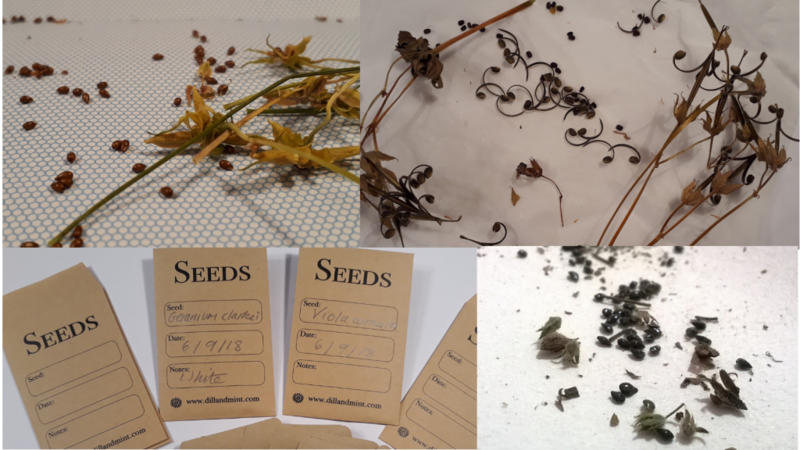 If kept in the best possible conditions seeds can continue to live in a dormant state for many years, but I usually aim to use home-collected seeds within two years. After that I collect fresh seed to use. Most seeds are best sown in the spring – see here for advice on sowing. All vegetables (apart from potatoes) will produce viable seed to save for next year’s crops. Just follow the same principles as above. Let some of the most productive and healthy vegetable plants flower and produce seedpods and allow these pods to ripen, go brown and dry out. Collect the pods on a dry day and allow them to dry out completely before removing the cases and storing the seeds. I have found that home-collected seed is great for developing more hardy vegetables; as you are naturally selecting the most successful plant to grow from each year. These are slightly different as you need to extract the seeds from the fruit – easy for apples and pears but a little messy for strawberries and currants. Make sure you have washed the fruit away from the seed and then dry and store them as above. The reason that seed production is an excellent way for plants to reproduce and spread is that it is sexual and involves the mixing of different DNA from the male pollen and female ovules. As a result the seed-generated ‘offspring’ are unique and can evolve and adapt, which is great for the survival of the species. However, it does mean that your seeds from the parent plant may not result in an identical plant – the colour of the flowers, growth habit etc. may vary. If you take seed from an ‘F1’ plant seed the plant will definitely not be the same as its parent. Similarly most fruit trees are grafted so the rootstock and fruiting parts of the tree have different DNA, so again your home-collected seed will grow into a tree less vigorous than its parent. I run practical, hands-on workshops on Plant Propagation methods covering seed collecting, sowing and taking plant cuttings.